My theory of the New Yorker having alternate editors seems to still be true, i.e. it is alternating between really interesting to really boring. I either read every single article in one weekend or feel completely indifference and read none. Feb 4th 2008 issue belongs to the former. I woke up at 9:30am this morning, and read till noon. 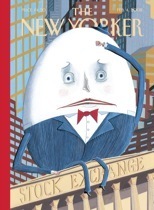 The cover cartoon is note-worthy considering recent economic mood on wall street, properly titled too “Humpty Dumpty Sat on a Wall…,” by Kathy Osborn. -The Sporting Scene: THE BOXING REBELLION, In the sport that Mao banned, Chinaâ€™s hopes rest on one man. by Evan Osnos. That one man is Zou Shiming, the captain of Chinaâ€™s boxing team. Chinese boxing officials have a name for their objective in this summerâ€™s Olympics, to be held in Beijing: the â€œzero-gold-medal breakthrough.” Zou Shiming is China’s best and only hope for the first Olympic boxing gold. – Dept. of Odds – Aces, Obama’s poker game. – The Political Scene/The Color of Politics/ Peter J. Boyer/ Cory Bookerâ€™s post-racial generation. This entry was posted in News & Media by Jean. Bookmark the permalink.